The Penny Post, for a letter up to a half-ounce in weight, was introduced on Friday January 10th 1840 and the adhesive postage stamp on Wednesday May 6th 1840.
and Chapel Street (where the Post Boxes were located). Following the erection of a grand new General Post Office in Plymouth, the citizens of Devonport wanted an impressive Post Office as well. Designed by local architect, Mr George Wightwick, it was built by a company of shareholders on the corner of Fore Street and Chapel Street. The premises had a semi-circular portico, in the style of Corinthian architecture, which formed a complete circle within the building. It cost £1,670, exclusive of the cost of the ground, the architect's fees and the Post Office fittings. Uniforms for postal employees were first displayed in the Three Towns on Sunday June 21st 1857. It consisted of a scarlet coat and royal cockades in their hats and an oil case cape for use in wet weather. The postmen also received a two shilling wage increase at the same time. The Post Office Savings Bank was started in 1861, half-penny postcards were introduced in 1870, the same year that Post Office telegraphs were started, and the penny savings card for schools were brought in in 1880. Postal Orders were introduced in 1881 and the parcel post service began in 1883. Horse-drawn mail carts were introduced in 1890 for rural deliveries. A pillar-box was erected in Valletort Road in July 1891, from which letters were cleared at 8.40am, 10.55am, 1.20pm, 2.50pm, 4.40pm, 6.45pm, 7.25pm, 9pm, and 11.05pm on weekdays and at 6.45pm and 11.05pm on Sundays. Devonport Post Office was rebuilt in 1912 at a cost of £7,000. The sorting of letters was transferred to a new central sorting office at Pennycomequick in 1928. Telegraph boys got motor-cycles in 1932. 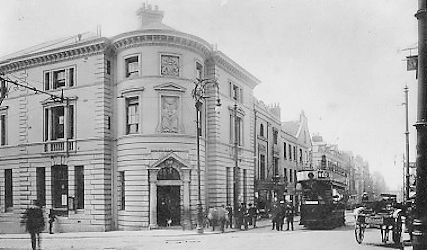 Although Devonport's Post Office survived the Blitz it had to be demolished because it fell within the new area requisitioned by the Admiralty for an extension to the Royal Dockyard. A new branch post office was opened in Granby Way. In 1969 the general Post Office became a public corporation.